Once upon a long ago, aka the late ‘70s, children searched for treasure. We pedaled banana-seat bikes to discount department stores – a K-Mart or Montgomery Ward, say – in hopes of striking gold in the record bins. Everything was cheaper there, but the titles were sparse, so in time we rode instead to a nearby music shop whose proprietor let us browse for what seemed like hours on end. And when we settled on a simple single, he thanked us for our purchase and wished us a good day. Later, we set out up a long and steep hill for a rinky-dink mall that housed a Sam Goody’s. The worker-clerks were more gruff and dismissive, and never thanked us for our cash, but it stocked a wider selection. “We” is me, of course, just as I am he as you are he as you are me and we are all together. Everything I heard, even the old, was new or new-to-me. But children grow into teens, 10-speeds replace banana seats, and the appetite for more (on the cheap, as we had limited budgets) led us to used-record stores. But my record buying notwithstanding, in the late ‘70s and early ’80s the music industry suffered a major slump. Hand in hand with the downward spiral, radio retrenched. 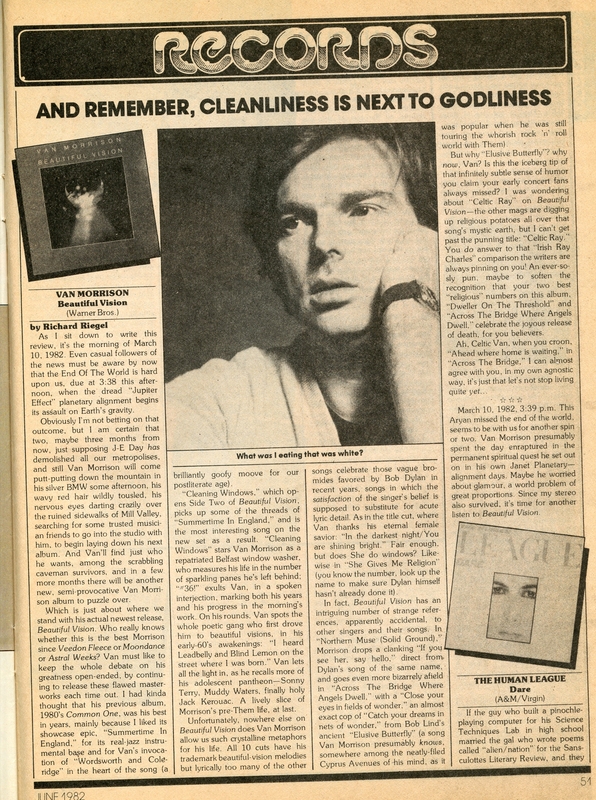 Few new artists were featured, and those who were – Dire Straits, for example – often sounded like the old. For the most part, punk and new wave could only be read about, not heard via the airwaves, on this shore. And though I liked much of the old, as this blog attests, I also wanted to hear a lot of the new. That’s when the days of buying albums from reviews alone began. About the same time, in the late ‘70s, I stumbled upon ITV’s The Kenny Everett Video Show. A British program, it aired throughout the U.S. thanks to the magic of syndication – in the Philly area, it was Saturday or Sunday afternoon. In addition to his outlandish (and not always funny) comedy, Everett – a British deejay by trade – featured a who’s who of established and rising British musicians. Paul McCartney & Wings were in the same episode as the Boomtown Rats, for example. That clip of the Pretenders, by the way, hails from March 15, 1979 – nine months prior to their self-titled debut album being released in the U.K. and 10 months before it was issued in the U.S. 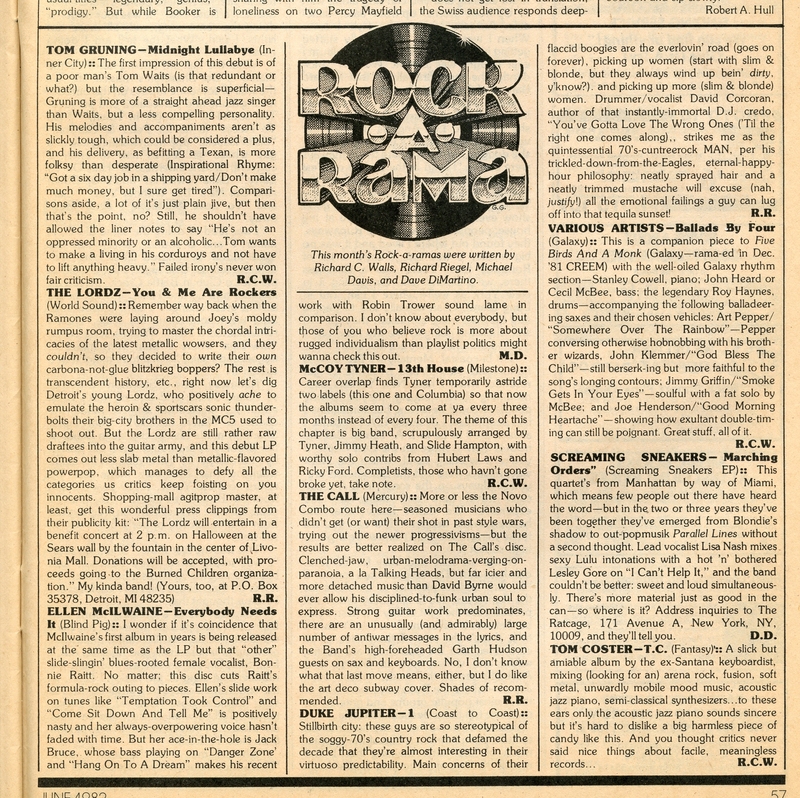 The Midnight Special and Don Kirschner’s Rock Concert were among the other outlets for music on TV, though – like rock radio – they focused primarily on the tried and true, not the new and untested. Solid Gold was for the hits. America’s Top 10, too. Slump or not, the music industry had become a Big Business, and Big Business is often short-sighted when it comes to seeding future growth. Unless they’re an upstart. Like MTV. The channel began life on August 1, 1981, but at first was only available in a handful of markets (aka the swamps of Jersey). Many viewers, including myself, didn’t actually experience it until the following spring or summer, thanks in part to a smart public relations campaign. 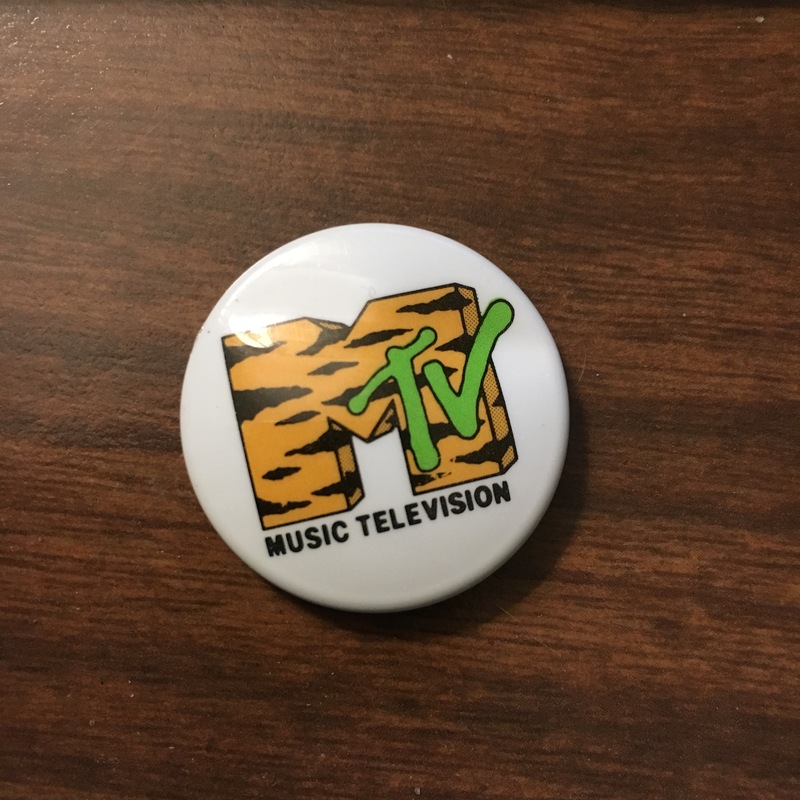 My aunt visited us that summer of ‘82, and I remember her commenting about how the TV – thanks to 16-year-old me – was usually tuned to MTV. I never heard that song on Philly’s twin pillars of rock radio, WMMR and WYSP. Only MTV. As the years progressed, however, they cast their net wider and began to reflect music fans like me, who enjoyed pretty much everything. At the same time, MTV also deserves some credit. It played quite a few artists who didn’t get much (if any) play elsewhere. Here’s one example: Romeo Void, whose “Never Say Never” was a staple of its early days. Joan Jett, the Go-Go’s, Michael Jackson, Madonna, Prince, Van Halen, and the Bangles are just a handful of the artists and acts whose success (or mega-success, in some cases) can be traced to their videos being placed in heavy rotation. John Cougar’s another. Spicing the non-AOR AOR format: the “veejays” who introduced the clips. I’ve been tripping the past fantastic since the release of 3×4 a few weeks back. The compelling Paisley Underground collection from the Bangles, Three O’Clock, Rain Parade and Dream Syndicate engulfs the soul like the ocean does the beach at high tide. The water is warm, in this metaphor, and free from the debris that sometimes washes ashore during the twice-daily deluge. Yes, for those unaware, there are two high tides each day, just as there are two low tides. They’re caused by the gravitational pull of the moon and sun in concert with Earth’s rotation, which is one spin per every 23 hours, 56 minutes and 4.09053 seconds. A similar phenomenon is found on 3×4, though its power is linked to the gravitational pull of the melodies and rhythms in concert with the rotational rate of the record – 33 1/3 rpm, in this case. Anyway, the Bangles broke through to popular acclaim in 1986 thanks to the shimmering psychedelia of “Manic Monday” and addictive goofiness of “Walk Like an Egyptian,” but the others never attracted as wide an audience as they should have. It’s a fact that was and remains a shame, and I’d blame the transitional nature of the times, but the reality is that’s the nature of the music business – quality bands and artists from every era fail to break through. And, with that said, here’s today’s Top 5: The Paisley Underground. 1) Rain Parade – “You Are My Friend.” At some point in late ’85 or early ’86, I picked up Rain Parade’s 1983 debut, Emergency Third Rail Power Trip, at City Lights records in State College, Pa. (aka the home of Penn State). I’d love to say that I played it to death, but the reality is I played it, enjoyed it from time to time, and moved on. On 3×4, the Dream Syndicate’s rendition of this song is one of the album’s highlights. Here’s some trivia: Rain Parade was founded by Matt Piucci and David Roeback. David had previously been in a band – alongside his brother (and fellow Rain Parade bandmate) Steven – with Susanna Hoffs. Roeback left Rain Parade and formed one of the greatest of the unheralded ‘80s bands, Opal, with former Dream Syndicate moll Kendra Smith (whose 1995 Five Ways of Disappearing album is a lost treasure of the ‘90s). 3) Rain Parade – “Talking in My Sleep.” Another 3×4 highlight is the Bangles’ rendition of this track, also from Rain Parade’s debut. And like the remake, the original version is far from a drowsy affair. 4) The Three O’Clock – “Jet Fighter.” The Bangles scorch the stratosphere with their turbo-charged cover of the Three O’Clock song; Debbi Peterson, who sings lead, even sounds like Michael Quercio. The initial rendition, found on the Three O’Clock’s classic Sixteen Tambourines album, rides the sky at a slightly slower Mach speed, but soars at a higher altitude. Every Monday, we rolled out of bed, ate breakfast while scanning the sports section of the morning newspaper, and headed to the bus stop, where we waited with a motley crew of kids from the neighborhood. At school, we navigated the halls on the way to and fro’ class, and fled at day’s end unless we had an after-school activity of some kind. The next morn, we did it again. And again after that, times three, until summer break came. After school, depending on weather and mood, we played in the street or the park, rode our bikes or walked to independently owned music and book stores in our small town’s business district, or hiked the long hill to the Village Mall, where we browsed the chain-store versions of the same. The main difference: the folks behind the counter at those independent stores knew my name. At the chain stores? They only knew my cash. In 1982, social media would have meant talk radio. Cable TV was around, but channels weren’t many. In the Philly area, the most important to get was PRISM, an HBO-like premium channel that, in addition to movies and specials, carried the home games of the Flyers. In some respects, life was less hectic. The news cycle played out in drips and drabs via the newspapers and evening newscasts, not the incessant drumbeat of disagreements that fill our Facebook and Twitter feeds. But, make no mistake, life was no less difficult then as now. June 1982, for example, saw America stuck in a wretched recession: Inflation clocked in at 7.2 percent while unemployment was 9.8 percent. I was 16, going on 17. New movies released this month include Poltergeist, Star Trek II: The Wrath of Khan, E.T., Grease 2 and Blade Runner. True story: one day later this month, after school had let out for the summer, a friend and I trekked to the Village Mall, which was home to an two-screen Eric movie theater. He took in Poltergeist. I took in…Grease 2. That’s just how I rolled. 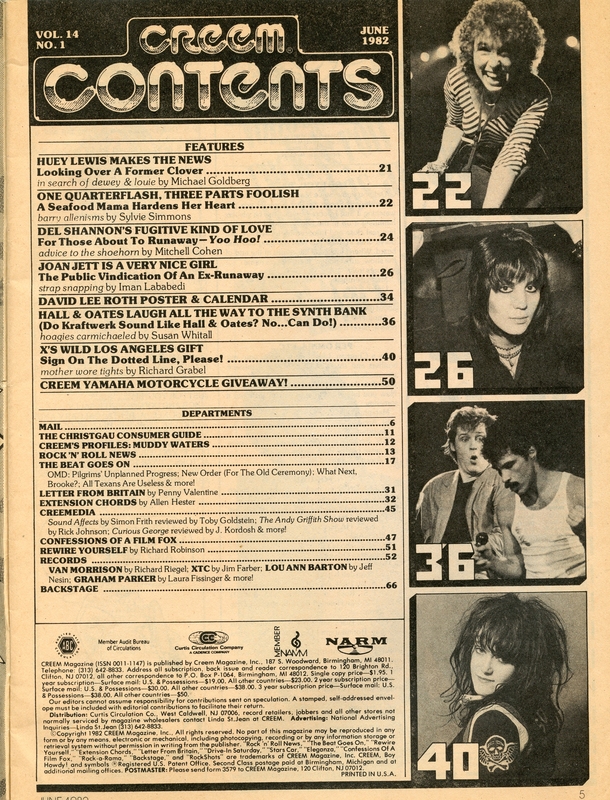 Which leads to today’s Top 5: June 1982 via Creem. 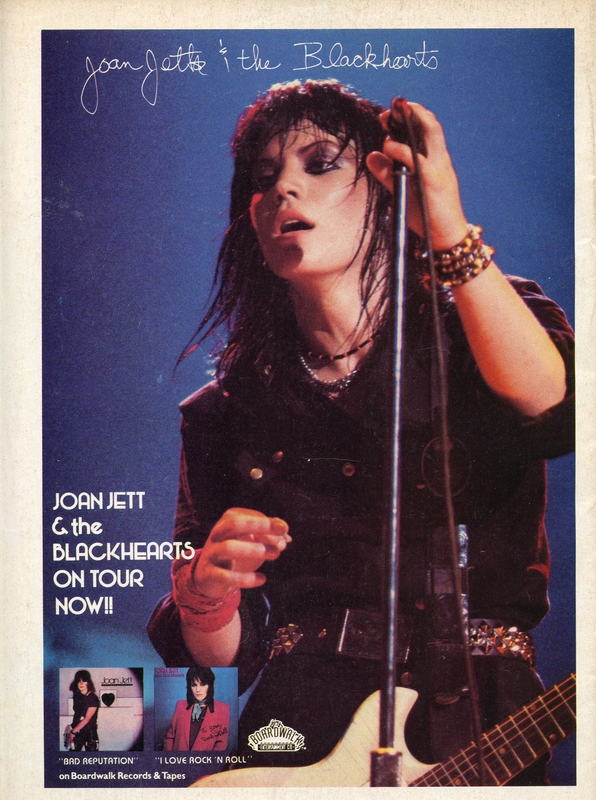 Joan Jett graces the front cover of the issue and, via an ad, the back. 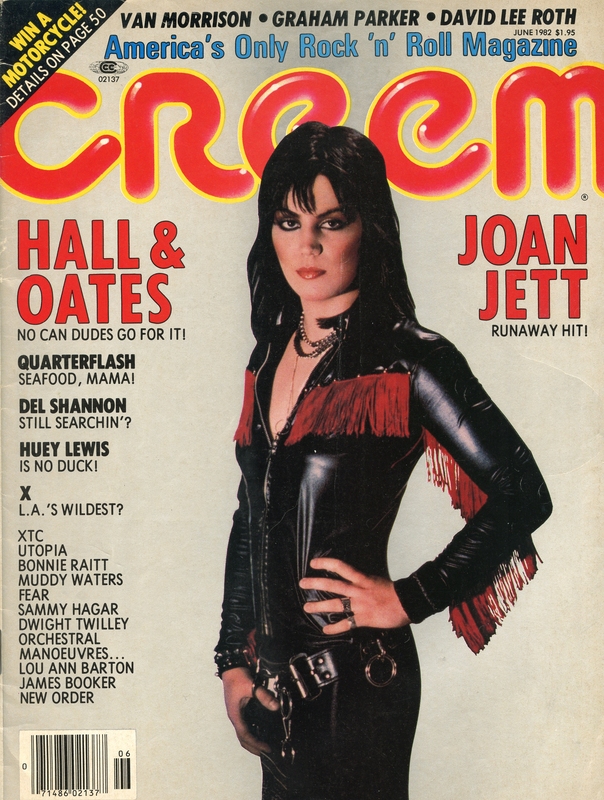 1) Joan Jett & the Blackhearts – “I Love Rock ’n Roll.” The Iman Lababedi-penned cover article chronicles Joan Jett’s ascent from the generally ignored Runaways to this point in time, when she was on a roll, having finished a seven-week run at No. 1 with “I Love Rock ’n Roll” on May 1st, and then cracking the Top 10 again this month with “Crimson & Clover,” to say nothing of her platinum-selling I Love Rock ’n Roll album. 2) Quarterflash – “Harden My Heart.” “In the United States, statistics show, a girl is walking out on her no-good man every 15 minutes. 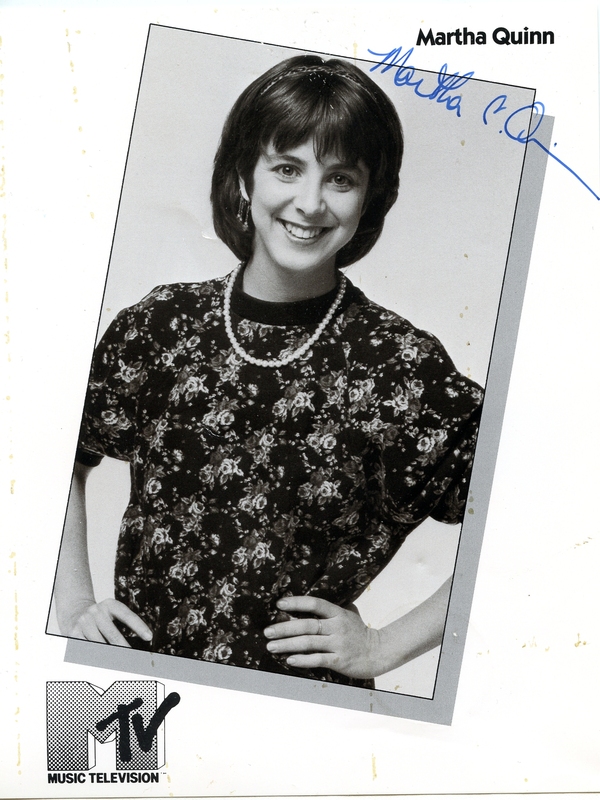 Statistics also show that 15 minutes later they’re going out and buying the Quarterflash record.” So begins music journalist Sylvie Simmons in this in-depth profile of the Portland, Oregon, band, which – to my ears – always sounded somewhat like Pat Benatar. Interestingly, the songs weren’t written by singer (and saxophonist) Rindy Ross, but her husband, guitarist Marv Ross.